No, this is not a complaint I suffer from, but a situation has arisen at fotoLibra which we’d like to sort out. 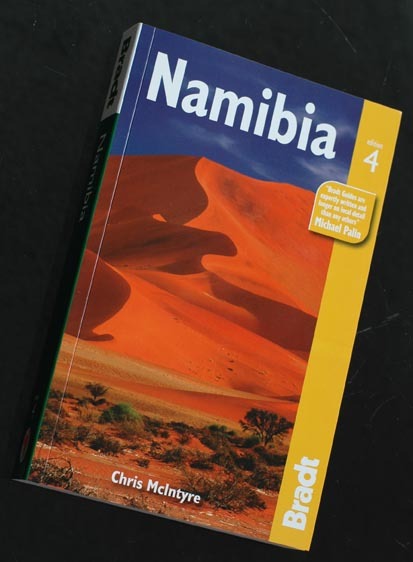 Here’s a new title from the highly regarded travel publisher Bradt Guides, who publish guide books for Serious Travellers, not tourist lubbers like me. Notice the cracking front cover image which fotoLibra sold them. It’s always good to get a front cover sale, not just for the money but also the prestige, especially by being associated with an imprint such as Bradt. The evocative photograph of “Dune 45” was taken by fotoLibra member Tjaart van Staden. We emailed him the good news and he took it very calmly. So calmly in fact that he didn’t respond. So we emailed him again. No reply. We wrote to him. A real letter, with a stamp. No answer. We checked his website. It had been taken down. Now Tjaart van Staden is not a common name in Wales, but it may well be in Midrand, Gauteng, South Africa, where Tjaart abides — or abode. We tried again and again, but we can’t find him. So we can’t pay him. I’m putting this blog up in the hope of tracking him down. If Tjaart ever succumbs to the old ego trip of Googling his own name, he’ll find this blog post and get in touch with us. But in case there’s a whole band of Tjaart van Staden impersonators out there, just be aware that a) there’ll be some questions asked to establish his identity and b) don’t put the deposit down on the Maserati just yet Tjaart, because the payment won’t cover it. Hello, TJAART VAN STADEN, formerly of MIDRAND, GAUTENG, SOUTH AFRICA — please contact fotoLibra, where you will hear some news to your advantage!